Payday loans in Delaware are regulated by the Title 5 and 978, 2227, 2744 chapters in particular. The amount you can borrow within a short-term loan is capped at $500; while the repayment period should not exceed 60 days. You may be offered a loan for a larger amount but under a different title. The authorities work hard to protect the choice of their citizens, and the first protection layer starts from licensing. The article gathers the peculiarities of payday loans legislation that have a significant impact on lenders, borrowers and 3rd party organizations. It is quite clear that to be able to conduct business on a legal basis, the lending agency must acquire a license, but apart from basic responsibilities lenders are required to keep track of the records on this or that loan decision – all the activity must be recorded and stored (the access to the records should be provided immediately if required by the court). Thus, if the agreement between the lender and a borrower is not achieved, and if for example the repayment was not completed as a result of lender’s actions, the records are requested and revised during legal proceedings. If the fault of the lender is confirmed, the repayment can be reduced (e.g. interest rate fees cut off) or even cancelled. Although an overwhelming majority of loan providers is shifting to online space, to obtain a license the company must have a legal address and physical space, used as office space or a physical pawnshop store. Lending agencies are required to educate their clients through providing comprehensive information on risks associated with payday loans; the phrase ‘a payday loan is not intended to meet long-term financial needs’ should be placed in visible areas. The agencies are required to present a breakdown of all the fees and charges to be collected before issuing the loan amount. Lending enterprises can charge and collect interest rate and the upper limit is not set for the amounts. 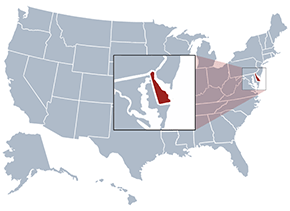 Unlike in other states, Delaware doesn’t has an APR cap set per $100, so picking up the rate remains a prerogative of a particular company (however, in accordance with non-official statistics it varies in the range of 260% – 1,930%. If a borrower fails to repay the loan, a rollover loan can be taken, but no more than 4 times. The state of Delaware allows having outstanding loans at one time, but their amount should not exceed $1,000. A borrower may get the entire loan amount and/or outstanding amount if the lender approves the request. However, lending agencies are empowered to charge extra amounts for refinancing. Each borrower has the right of recission which means that the loan amount can be returned in the event it became not needed. The loan amount should be returned in full the day the loan was issued or the next business day during business hours.